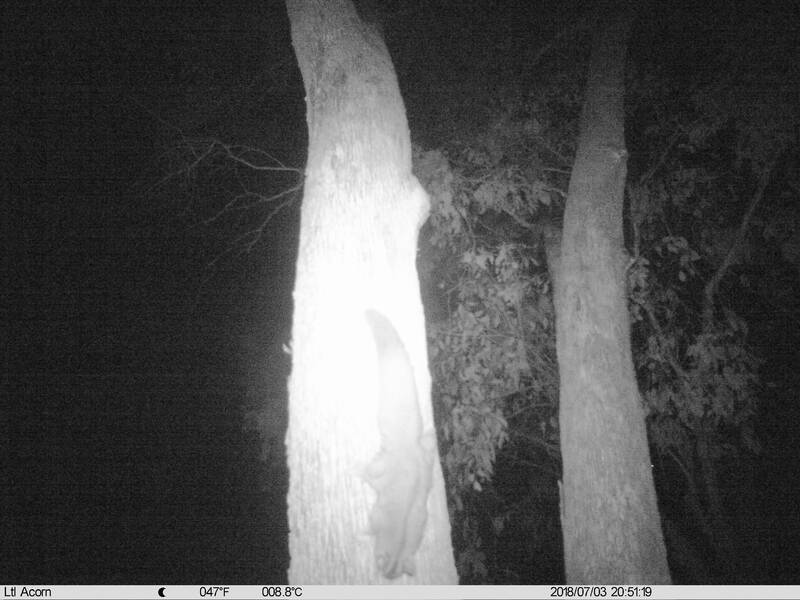 Our search for Squirrel Gliders in Albury’s urban growth corridor has begun! 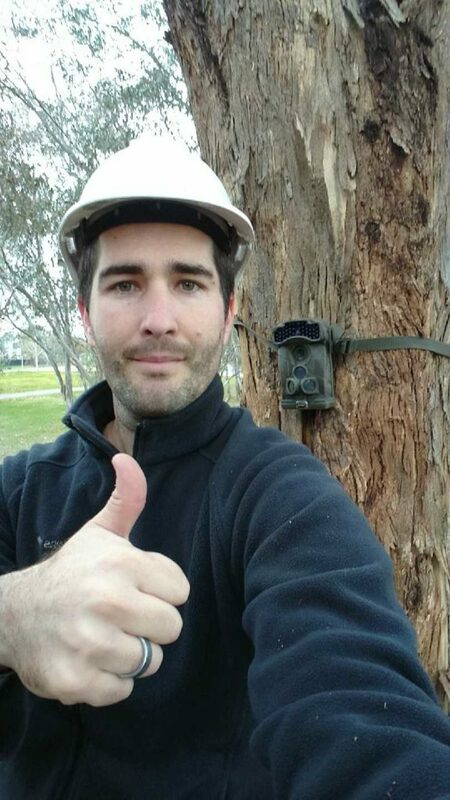 After years of planning, in June Albury Conservation Company’s wildlife ecologist Dylan McWhinney began installing motion-sensing cameras at sites across Thurgoona / Wirlinga. The subject of the monitoring program is the iconic and ellusive Squirrel Glider. The photo above is one of the first images captured in the program. Recruited in May, Dylan’s task is to coordinate year one of the monitoring program, based on a monitoring plan developed by the Australian Research Centre for Urban Ecology (ARCUE), and addended following a peer review conducted by Albury Conservation Company board member Dr Damian Michael. Albury Conservation Company committed its own funding to develop the plan (in partnership with NSW Department of Industry – Lands) and to engage a wildlife ecologist to kick-start the program. In order to undertake the research, an Animal Ethics approval from Charles Sturt University was obtained, as well as a wildlife research permit from NSW Office of Environment and Heritage. Access to the Albury Environmental Land network was also arranged via the NSW Department of Industry – Lands. Why is the monitoring being done? Squirrel Gliders are a threatened species in NSW, listed as ‘vulnerable’. This means they are on the slippery slope to extinction. Thurgoona contains significant populations of the animal, which is increasingly under threat posed by urbanisation – Thurgoona is the designated major urban groth corridor of Albury. Until now, monitoring of gliders locally has been site specific (e.g. a requirement of an individual development application) or opportunistic (e.g. nestbox checks). Hence we do not know with confidence whether the local populations are increasing, stable or in decline. This strategic, long-term monitoring program aims to provide such insight, and critically raise the alarm if a serious threat is detected at specific sites, allowing responsible authorities the opportunity to act. Before it is too late. How is the monitoring being done? The main tool being used to monitor for Squirrel Gliders are motion-sensing cameras. Albury Conservation Company purchased 30 cameras for use in the program. The cameras were funded via two sources: a grant from Wettenhall Environment Trust, and via donations to our 2018 Edge Pledge campaign. We are incredibly grateful to our program sponsors and donors, and we look forward to sharing the the results from the program with them. each camera is deployed for 10 days per site. The cameras are being placed at a variety of sites around Thurgoona / Wirlinga including urban, peri-urban (approved development / proposed development), rural, riparian, remnant woodland, roadside reserves and revegetation. Over 100,000 images have been captured by the cameras in round one of the program. For interested volunteers, we would love a hand checking individual photos and identifying which ones contain gliders and other wildlife – please get in touch with us if you are interested. We will be conducting events to promote the program – follow us on Facebook for announcements. Join our mailing list by filling in your details at the top right hand corner of this website.